Exfoliating is a very important part of any skin care regime. Not only does it slough away dead skin cells, but it also unclogs the oil and dirt that lives in your pores and can cause breakouts. Facial scrub is just one of the many treatments you can make at home, and using soothing, hydrating ingredients will help protect your skin against irritation. Have a look at 6 really simple facial scrubs that can be used on sensitive facial skin. Take 2 tablespoons dried orange peel powder, 2 tablespoons oatmeal, 1 teaspoon honey and 1 tablespoon water. Combine all ingredients in a bowl and mix together well. Clean your skin thoroughly with a mild face wash and then gently massage this scrub on your face for 1-2 minutes. Rinse well with warm water. Pat dry and then moisturise your face as usual. Mash a banana and mix in a teaspoon of oatmeal. 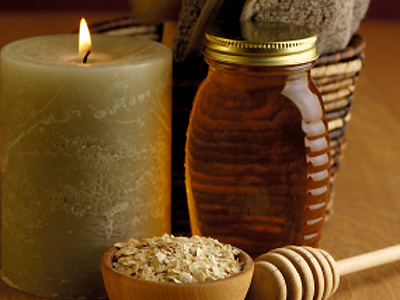 Last, add a teaspoon of honey to hydrate and soothe the skin. Gently massage the scrub into the skin for a few minutes and then rinse it off with cool water. Take one tomato and cut it into two pieces. Take one piece and dip it in sugar and then gently rub it on your face and neck. Leave it on your face for 5 minutes and then rub the second piece on your face so that your face is moistened by the tomato juice. Leave it on for few minutes or until it gets dry before washing your face with lukewarm water. Tone and moisturise as usual. Take 1 tbs Honey, 1 tbs yogurt and 1 tbs lemon juice one ripe banana and 1 tbs oatmeal. Mix all the ingredients in a bowl. 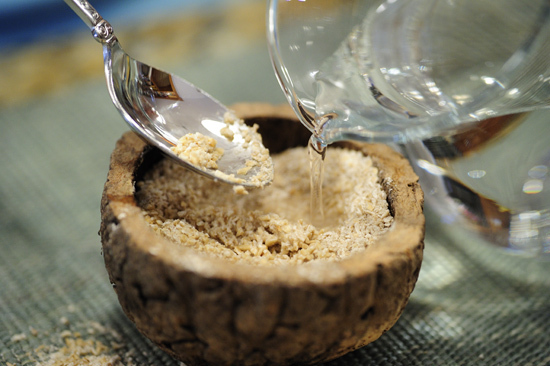 Massage the homemade facial scrub into your skin. Use a circular motion and gently rub for a few minutes. You can also leave the mixture on for five to 10 minutes as a facial mask. Remove the facial scrub by rinsing it with cool water. Alternatively, you may use a warm wash cloth to steam the mixture off of your skin. Combine 1 tablespoon of ground oatmeal with 1/4 teaspoon of salt, which boosts the face treatment’s exfoliating properties, and 1 teaspoon of water or olive oil to make it into a paste. Gently rub it onto your skin in circular motions, let sit for five to 10 minutes and rinse. Ground oatmeal has been known to soothe and heal everything from acne to sunburn to dry, flaky skin. Given its gentle nature, it is also ideal for those with sensitive skin. Squeeze juice from half a lemon. Add two teaspoons of rose water and a teaspoon of rice powder to this juice mixture. Blend well to form a thick paste. Spread this scrub on your facial skin and let it sit there for 5 minutes. After that, wet your finger tips and gently start scrubbing in circular motion. Scrub for 5 minutes and allow the mixture for more two minutes and wash off with plenty of cold water. Rice powder acts as a dead cell and tan removing scrub while the lemon juice naturally whitens skin. I just tried the oatmeal/salt/olive oil scrub…. it works fantastic…. my skin felt very oily after rinsing off due to the olive oil, but after 10 minutes I noticed my skin had absorbed the oil, no greasy oily felling remained at all…. just that my face felt as soft and smooth as a brand new babies skin….. will be using this scrub over and over….. try it I think you’ll like it !! !